The landscape of farm land in Mason County has drastically changed. Within Riverton and Summit townships, Consumers Energy has finished erecting 56 wind turbine generators, called the Lake Winds Energy Park. This 100 megawatt facility began operations on Thanksgiving Day 2012, providing employment, economic and tax benefits to the area. Gene's Ventures conducts tours of the Lake Winds Energy Park during the spring, summer and fall. He is the only one in the state of Michigan who gives these types of tours...and even allows people to stand right underneath the turbine and touch it. For more information, call Gene at (231) 690-1775. Consumers Energy secured more than 16,000 acres south of Ludington and east of the current Ludington Pumped Storage Plant, also owned by Consumers. Mason County was chosen partly due to the positive wind force off Lake Michigan and also because of the wind ordinance here that ensures public safety. 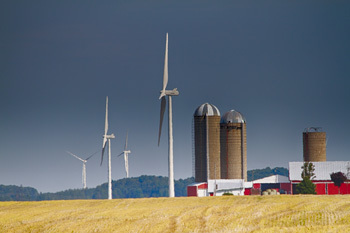 A wind analysis was conducted by Consumers Energy and it was determined that Riverton and Summit townships held the most potential for wind production. 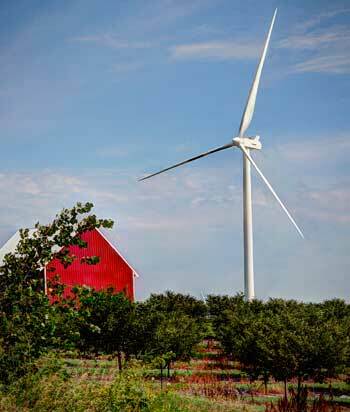 Wind farms are basically a cluster of wind turbines that capture the wind and convert it to electricity. The 56 turbines in Lake Winds Energy Park are 476' in height providing 100 megawatts of energy. Parts for the turbines arrived in Mason County via railroad and truck and were stored at the former Harbison-Walker plant on Pere Marquette Highway before being moved to their permanent location by tractor trailer. Wind power is seen by some to be the energy source of the future, and helps offset emissions of carbon dioxide and greenhouse gases. It is estimated that this project will bring $33 million directly and indirectly to Mason County, along with 150 construction jobs.